In a century which has seen the cracking of Linear B, Ugaritic, and other orthographic systems, the Phaistos Disk has eluded decipherment. The disk is thought to date from around 1700 BC. 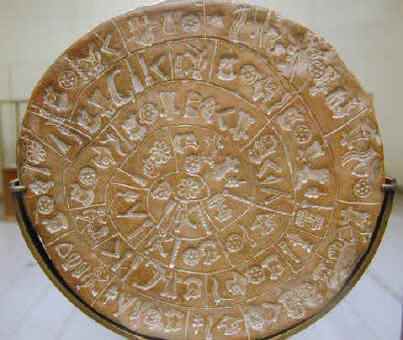 The disc of Phaistos is the most important example of hieroglyphic inscription from Crete and was discovered in 1903 in a small room near the depositories of the "archive chamber", in the north - east apartments of the palace, together with a Linear A tablet and pottery dated to the beginning of the Neo-palatial period (1700- 1600 B.C.). The exact location of Phaistos was first determined in the middle of the 19th century by the British admiral Spratt, while the archaeological investigation of the palace started in 1884 by the Italians F. Halbherr and A. Taramelli. After the declaration of the independent Cretan State in 1898, excavations were carried out by F. Halbherr and L. Pernier in 1900-1904 and later, in 1950-1971, by Doro Levi, under the auspices of the Italian Archaeological School at Athens. was discovered in Crete in 1908. Although many inscriptions were found by the archaeologists, they are all in Linear A code which is still undecipherd, and all we know about the site, even its name are based to the ancient writers and findings from Knossos. According to mythology, Phaistos was the seat of king Radamanthis, brother of king Minos. It was also the city that gave birth to the great wise man and soothsayer Epimenidis, one of the seven wise men of the ancient world. Excavations by archaeologists have unearthed ruins of the Neolithic times (3.000 B.C.). During the Minoan times, Phaistos was a very important city-state. Its dominion, at its peak, stretched from Lithinon to Psychion and included the Paximadia islands. The city participated to the Trojan war and later became one of the most important cities-states of the Dorian period. Phaistos continued to flourish during Archaic, Classical and Hellenistic times. It was destroyed by the Gortynians during the 3rd century B.C. In spite of that, Phaistos continued to exist during the Roman period. Phaistos had two ports, Matala and Kommos. Since 1900, continuous archaeological excavations from the Italian Archaeological School, have brought to light the magnificent Minoan palace of Phaistos with its great royal courts, the great staircases, the theatre, the storerooms and the famous disk of Phaistos. The first palace was built at 2.000 B.C. This palace was destroyed at 1.700 B.C. by an earthquake. It was built again, more luxurious and magnificent and it was destroyed again, probably by another earthquake, at 1.400 B.C. The location of the palace was carefully chosen, so as not only to absolutely control the valley of Messara, but to also offer a panoramic view of the surrounding area with the scattered villages, just like today, at the foot of the mountains Psiloritis and Asterousia. The palace dominated and controlled the Messara valley and it was the center of the city. It was the administrational and economical center of the area. Goods not only for consumption but mainly for trade were kept in its huge storerooms. The palace was surrounded by luxurious mansions and crowded urban communities. Along with the surrounding settlements covered an area of 18.000 sq. meters. A paved road leads to the ruins of the Royal Minoan villa of Agia Triada, 3 km west of Phaistos. Both surfaces of this clay disc are covered with hieroglyphs arranged in a spiral zone, impressed on the clay when it was damp. The signs make up groups divided from each other by vertical lines, and each of these groups should represent a word. Forty five different types of signs have been distinguished, of which a few can be identified with the hieroglyphs in use in the Proto- palatial period. Some hieroglyphic sequences recur like refrains, suggesting a religious hymn, and Pernier regards the content of the text as ritual. Others have suggested that the text is a list of soldiers, and lately Davis has interpreted it as a document in the Hittic language in which a king discusses the erection of the Palace of Phaistos. In a century which has seen the cracking of Linear B, Ugaritic, and other orthographic systems, the Phaistos Disk has eluded decipherment. The disk is thought to date from around 1700 BC. It is a roundish disk of clay, with symbols stamped into it. The text consists of 61 words, 16 of which are accompanied by a mysterious "slash" mark. There are 45 different symbols occurring 241 times. The symbols portray recognizable objects like human figures and body parts, animals, weapons, and plants. Since the text of the disk is so short, decipherment by the statistical cryptographic techniques employed by Michael Ventris in cracking Linear B are impossible. Late last year, however, Dr. Keith A.J. Massey and his twin brother Rev. Kevin Massey-Gillespie discovered the secret they believe provides the key to cracking the Phaistos Disk. Another ancient writing system provides the key to reading the Phaistos Disk. At Byblos in modern day Lebanon, an advanced culture flourished for centuries. There are many signs of contact between Ancient Crete and Byblos, including signs of orthographic borrowing as pointed out by Victor Kenna in "The Stamp Seal, Byblos 6593" Kadmos 9 (1970) pp 93-96. Further, examples of the yet undeciphered Linear A script have recently been found in Turkey, providing evidence of orthographic relationships between Crete and Asia Minor. The Proto-Byblic script was used in the early part of the 2nd millenium BC, a time contemporary with the supposed date of the Phaistos Disk. The underlying language of the Proto-Byblic script was Semitic. It is a linear script which displays many identifiable objects, like weapons, human figures, and body parts. The Proto-Byblic script, catalogued by Maurice Dunand in the 1940's bears striking resemblance to the symbols of the Phaistos Disk. The similarity of one Proto-Byblic character to a Phaistos symbol was noted by Dunand in his book Byblia Grammata, Beyrouth, 1945 on p 90, "Il est presque identique a celui du disque de Phaestos qu-Evans avait identifie avec une colombe." [ It is almost identical to something from the disk of Phaistos which (Sir Arthur) Evans has identified with a dove.] Dunand did not pursue his observation of the similarities, yet it is this Proto-Byblic script which is demonstrated by the Massey twins as being a closely related orthographic system to the Phaistos Disk. Eduard Dhorme, one of the decipherers of Hittite, published the first consonantal values for the Proto-Byblic script in SYRIA XXV 1946 in an article, "Dechiffrement des Inscriptions Pseudo-Hieroglyphicques de Byblos." 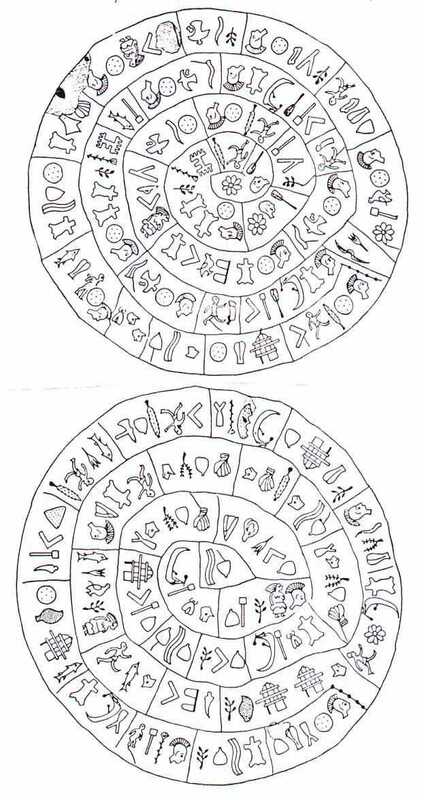 A comparison of these values with the symbols of the Phaistos Disk yielded consonantal assignments for a surprising amount of the writing on the disk. It should be noted here that all previous attempts to decipher the Phaistos Disk have been subjective attempts, assigning phonetic values to the characters with no true objective criteria. This is therefore the first effort at cracking the disk by OBJECTIVE determinations. When these consonantal values are examined, elements of an Hellenic language emerge in the text of the disk. Scholars had never known what the significence of a mysterious "slash" on 16 of the words of the Phaistos Disk. We observed, based on our values, that each of these 16 words are numerals counting commodities on the disk, similar to the majority of Linear B texts. The most impressive aspect of Glyphbreaker is not so much that this remarkable man has cracked two entirely different scripts, a feat unique in the history of epigraphy, but rather that he has done so despite tremendous privations in his life.... Regardless of the eventual validity of Fischer's solutions--and certainly to a nonlinguist who does not know a grapheme from a glyph, his method, as painstakingly explained here, appears logical, objective and impeccable--one cannot but admire the selfless and single-minded dedication with which he has pursued his goal. When he successfully deciphered the Rongorongo script of Easter Islandthe mysterious system of glyphs in which the island's original inhabitants had recorded their ritual chants and ceremoniesSteven Roger Fischer gained a unique place in the pantheon of glyphbreakers. He is the only person who has ever deciphered not one but two ancient scripts. Both of these scripts yield clues of great historical importance. 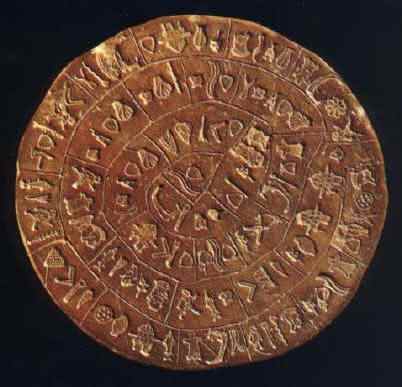 Fischer's previous decipherment, of a Cretan artifact called the Phaistos Disk, provided the key to the ancient Minoan language and showed it to be closely related to Mycenaean Greek. Contrary to prevailing archaeological opinion, the Minoans were Greeks, and Crete's Phaistos Disk now comprises Europe's oldest documented literature. Fischer's decipherment of Rongorongo showed that it was not merely a mnemonic device for recalling memorized texts, but was physically read and was the vehicle for creative composition. Rongorongo is thus the only known indigen! ous script in Oceania before the twentieth century. Filled with accounts of the remarkable journeys and cultures he encountered, Glyphbreaker is the exciting story of these two decipherments, by the man who now must rank as the greatest glyphbreaker of all time. Written by the greatest decipherer that ever lived, Steven Roger Fischer--the only person to ever decipher two ancient scripts--"Glyphbreaker" is the remarkable story of his two decipherments, . 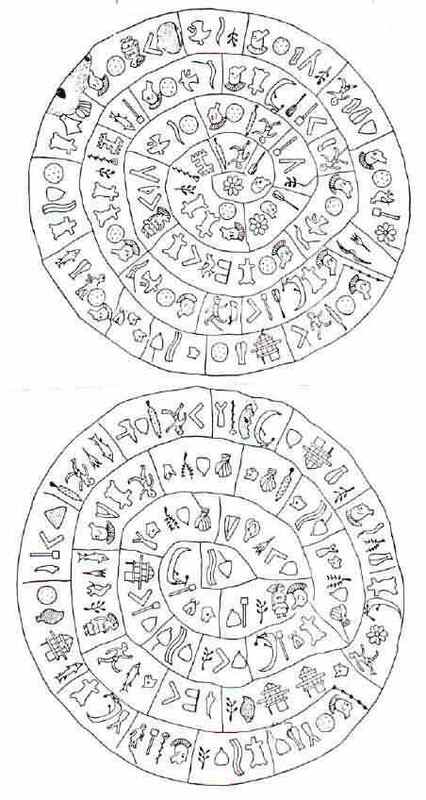 the Rongorongo script of Easter Island and the Phaistos Disk, and their historical significance. Filled with accounts of the remarkable journeys and cultures he encountered, the book is fascinating reading for anyone interested in the subject. 15 illus., 5 in color Pub: 8/97. Steven Roger Fischer is Director of the Institute of Polynesian Languages and Literatures, Auckland, New Zealand. He is the first person ever who deciphered two wholly different historical scripts. Glyphbreaker is his eighth book. Fascinating details of the religious and economic history of an ancient pre-Hellenic civilization are revealed in this celebrated account of the decipherment of Linear B from Mycenaean Greek in the 1950s. The book shows how the mysterious symbols of the Phaistos Disc, found in Crete at the beginning of the 20th century, can be used to demonstrate a fantastic system of measuring time, space and distance, that existed as early as 3,500 BC in the Far West of Europe. This book is an easy to follow read, beautifully crafted, and with parenthesis to sift out the mathematics for people who are willing to take the author's word. The Bronze Age Computer Disc ends with a promise of many more revelations to come. with 272 pages all in colour and 640 images. This bilingual archaeological book is intended for everyone. Beautifully pictured and detailed, it reveals the fascinating story of the discovery of the localization of“Atlantis.” It is the first scientific deciphering of the pictogram writing of Atlantis. Fruit of twenty years of research, the author guides us back to the source of our heritage clustered in the human flight of the imagination. He leads us on the road to find Atlantis lost 12 000 years ago. Discover how the deciphering of the Phaistos, Aztec and Maya disks and Egyptian frescos reveal important messages from our past. These archaeological enigmas that have been gazing at us for thousands of years, represent a precious legacy from the greatest civilizations of distant Antiquity. By meeting and joining they reveal the exact geographical location of Atlantis and the origins of the human race. “Atlantis' Messages de l’Atlantide” is the fulfilment of a 5 000 year old prophecy. It is the work and devotion of a lifelong project that brings the past and the future to the present. Summary: Minoan Millennium-Calendar in Harmony with the Cosmos. Archeoastronomical document from the 2nd Millennium B.C.